The Atlas of the antiquity has to be filled with maps. More information: Update the atlas. The Beginnings of Historic Greece. 700 - 600 B.C. 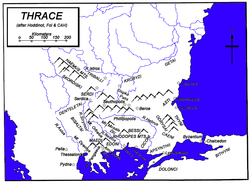 Dacia in Ist century A.D.
Geography of the Ancient Rome: Roman Empire, 116AD ; provinces, mediterranean shores (Mare Nostrum). Chernyakhov culture, 4th century, in orange color. Genuine Goth people mix with Getes(Scythic tribes), as known previously by the Greeks. Locator of Dacia ; from 2nd century to 376 it is the first settlement kingdom for the Goths at the borderline of the Empire.